· Other mechanisms by which supraventricular tachycardia (SVT) can occur include enhanced automaticity and triggered activity. · SVT from enhanced automaticity: Unlike reentrant SVT, which is dependent on the presence of a reentrant circuit, SVT from enhanced automaticity is dependent on cells with automatic properties. Cells with pacemaking properties exhibit diastolic depolarization characterized by a slowly rising slope during phase 4 of the action potential. Once threshold potential is reached, the cells discharge automatically. This is in contrast to non-pacemaking cells, in which phase 4 is flat and therefore the resting potential never reaches threshold (Fig. 17.1A, B). · Examples of cells with automatic properties are cells within the sinus node, atrioventricular (AV) junction, and throughout the AV conduction system except the midportion of the AV node. Although the cells of the AV conduction system have automatic properties and are capable of discharging spontaneously, their rate of discharge is slower than that of the sinus node. These cells therefore are depolarized by the propagated sinus impulse and serve as backup or latent pacemakers. Figure 17.1: Pacemaking and Non-pacemaking Cell. (A) Action potential of pacemaking cells. Pacemaking cells exhibit slow diastolic depolarization during phase 4 and discharge automatically when phase 4 reaches threshold potential. (B) Action potential of non-pacemaking cells. In non-pacemaking cells, phase 4 is flat and the action potential never reaches threshold. The numbers 0, 1, 2, 3, and 4 represent the different phases of the transmembrane action potential. · Ordinary working myocytes in the atria and ventricles do not exhibit phase 4 diastolic depolarization, but may develop this property when they become pathologic, as would occur during ischemia or injury. o Pathologic sinus tachycardia: This tachycardia is due to enhanced automaticity of the sinus node cells and may be clinically difficult to differentiate from physiologic sinus tachycardia (Fig. 17.2A). o Atrial tachycardia: The atria, including the atrial appendage, large veins draining into the atria (pulmonary veins, vena cava, and coronary sinus) or even the mitral or tricuspid annulus, may contain cells with properties of automaticity. The rate of discharge of these cells may be enhanced, resulting in atrial tachycardia. The tachycardia may be unifocal or focal (Fig. 17.2B) or it may be multifocal (Fig. 17.2C). § Focal atrial tachycardia: The tachycardia originates from a single focus in the atria or from a venous connection contiguous to the atria such as the pulmonary veins or vena cava. § Multifocal atrial tachycardia: The tachycardia is multifocal if several ectopic foci are present in the atria. o AV junctional tachycardia: The tachycardia arises from the AV junction, which includes the AV node down to the bifurcation of the bundle of His (Fig. 17.2D). Junctional tachycardia can be paroxysmal or nonparoxysmal. § Nonparoxysmal junctional tachycardia: The tachycardia arises from a focus in the AV junction and has a relatively slow rate of 70 to 120 beats per minute (bpm). § Paroxysmal junctional tachycardia: The tachycardia is paroxysmal because it starts abruptly and terminates suddenly. The tachycardia has a faster rate varying from 120 to 180 bpm. Figure 17.2: Automatic Supraventricular Tachycardia (SVT). Automatic SVT can occur anywhere in the atria or atrioventricular junction. (A) Pathologic or inappropriate sinus tachycardia. (B) Focal atrial tachycardia arising from a single focus in the atria. (C) Multifocal atria tachycardia showing multiple foci in the atria. (D) Junctional tachycardia, which can be paroxysmal or nonparoxysmal. · Focal atrial tachycardia: Focal atrial tachycardia implies that the tachycardia arises from a single location in the atria. The atrial impulse spreads in a circumferential manner regardless of the mechanism of the tachycardia. Thus, the tachycardia may be due to enhanced automaticity (automatic atrial tachycardia), intra-atrial micro-reentry (intraatrial reentrant tachycardia), or triggered automaticity (atrial tachycardia with 2:1 AV block). The mechanisms underlying these tachycardias cannot be differentiated from one another with a 12-lead electrocardiogram (ECG). Because these tachycardias all look similar, any tachycardia originating from a single focus in the atria that spreads circumferentially is focal atrial tachycardia (Figure 17.3). o Presence of a regular narrow complex tachycardia >100 bpm. o Ectopic P waves, which are different from sinus P waves, precede the QRS complexes usually with a PR interval ≥0.12 seconds. o The P waves are uniform and the atrial rate varies to as high as 250 bpm. The baseline between the P waves is usually flat or isoelectric and not wavy or undulating as in atrial flutter. o Second-degree or higher grades of AV block may occur because the tachycardia is not dependent on the AV node. o The tachycardia terminates with a QRS complex in contrast to reentrant SVT (atrioventricular nodal reentrant tachycardia [AVNRT] and atrioventricular reentrant tachycardia [AVRT]), which usually terminates with a retrograde P wave (Fig. 17.4). · Although nonsustained focal atrial tachycardia is frequently seen during cardiac monitoring in the coronary or intensive care units, sustained focal atrial tachycardia is rare, occurring in <0.5% of symptomatic patients. The sustained form is slightly more common in children than in adults but is also a rare clinical entity. The tachycardia can be incessant (persists more than 12 hours per day), which can result in tachycardia-mediated cardiomyopathy. · Focal atrial discharges do not occur randomly. They frequently cluster in certain areas in the atria such as the mitral or tricuspid annulus, atrial appendages, ostium of the coronary sinus, and along the crista terminalis. Spontaneous focal discharges from the pulmonary veins are too small to be recorded in the surface ECG, but have been recorded by intracardiac techniques. These focal discharges can result in SVT and have also been implicated as an important cause of atrial fibrillation. · Localizing the origin of the tachycardia: In focal atrial tachycardia, the origin of the tachycardia may be localized by the morphology of the P waves. The most useful lead is V1followed by lead aVL (see Fig. 17.5). § Right atrial origin: If the tachycardia is of right atrial origin, the P waves are inverted in V1. If biphasic in V1, the P waves are initially positive (upright) and terminally negative (inverted). In lead aVL, the P waves are upright or biphasic (Fig. 17.5A). § Left atrial origin: If the tachycardia is left atrial in origin, the P waves are upright in V1. If V1, is biphasic, the P waves are initially negative (inverted) and terminally positive (upright). In aVL, the P waves are negative or isoelectric (flat) (Fig. 17.5B). Figure 17.3: Focal Atrial Tachycardia. (A) A 12-lead electrocardiogram showing focal atrial tachycardia with a rate of 136 beats per minute. The P waves are uniform in configuration and are upright in I, II, III, aVF, and V1. The tachycardia can be mistaken for sinus tachycardia. (B) Lead II rhythm strip showing spontaneous conversion of the tachycardia to normal sinus rhythm. Note that the P wave morphology is different during tachycardia and during normal sinus rhythm. Note also that the tachycardia terminated with a QRS complex (block arrow) rather than a retrograde P wave, suggesting that the SVT is due to focal atrial tachycardia. Figure 17.4: Focal Atrial Tachycardia. The rhythm strip was recorded in lead II. The left side of the rhythm strip shows focal atrial tachycardia with P waves between QRS complexes (arrows). The tachycardia terminated spontaneously followed by a sinus P wave and back to back ventricular complexes. Normal sinus rhythm followed as shown on the right side of the tracing. Note that the tachycardia terminated with a ventricular complex (block arrow) rather than a P wave. SVT terminating with a QRS complex is usually from focal atrial tachycardia. This type of SVT may not respond to adenosine. Figure 17.5: Focal Atrial Tachycardia. The origin of the tachycardia can be identified as right atrial or left atrial based on the configuration of the P waves in leads V1 and aVL. If the ectopic focus is in the right atrium (A), the P waves are inverted in V1 or if biphasic are initially upright and terminally negative. In lead aVL, the P waves are upright or biphasic. If the ectopic focus is in the left atrium (B), the P waves are positive in V1. If biphasic, the P waves are initially inverted and terminally upright. In lead aVL, the P waves are isoelectric (flat) or inverted. AV, atrioventricular; RA, right atrium; LA, left atrium. § Superior origin: If the tachycardia originates superiorly in either right or left atria, the P waves are upright in II, III, and aVF. Superior origin of the atrial tachycardia includes the atrial appendages and superior pulmonary veins (Fig. 17.6A). The tachycardia may be difficult to differentiate from sinus tachycardia. § Inferior origin: If the tachycardia originates inferiorly in either right or left atria, the P waves are inverted in leads II, III, and aVF. Inferior origin of the atrial tachycardia includes the inferior vena cava and coronary sinus orifice as well as the inferior pulmonary veins (Fig. 17.6B). o Examples of focal atrial tachycardia are shown in Figs. 17.7,17.8,17.9,17.10. Figure 17.6: Focal Atrial Tachycardia. If the P waves are upright in II, III and aVF, the origin of the tachycardia is in the superior right or left atria (A). If the P waves are inverted in II, III, and aVF, the origin of the tachycardia is in the inferior right or left atria (B). · Presence of a regular narrow complex tachycardia >100 bpm. · The P waves are uniform in configuration but are different in morphology when compared with P waves of normal sinus origin. · The P waves precede the QRS complexes with a PR interval shorter than the R-P interval. This finding, however, may be reversed depending on the integrity of the AV node and presence of AV conduction abnormality. The PR interval generally measures ≥0.12 seconds. · Second degree or higher grades of AV block may occur because the tachycardia is not dependent on the AV node. · The baseline between 2 P waves is isoelectric unlike atrial flutter where the baseline is wavy and undulating. · The tachycardia terminates with a QRS complex rather than a P wave. · Focal atrial tachycardia is a type of SVT originating from a single focus in the atria. The impulse spreads to the atria in a circumferential manner. The mechanism of the tachycardia may be due to intraatrial reentry, enhanced automaticity, or triggered activity. These mechanisms are impossible to differentiate using the 12-lead ECG. Focal atrial tachycardia do not occur at random but originate more commonly in the right atrium as well as veins that drain directly into the atria such as the pulmonary veins, vena cava, and coronary sinus. They can also originate from the atrial appendages, mitral or tricuspid annulus, left side of the atrial septum, and crista terminalis. · The P waves are uniform in configuration because the tachycardia originates from a single focus. 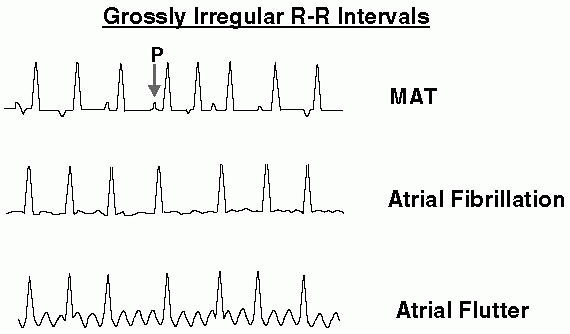 The PR interval is usually ≥0.12 seconds in duration because the impulse has to travel within the atria and across the AV node before reaching the ventricles. The configuration of the P waves is different from P waves of normal sinus rhythm and is helpful in identifying the origin of the tachycardia. o When the tachycardia originates from the right atrium, the P waves are inverted in V1. If biphasic, the P wave is initially upright and terminally inverted. The P waves are upright in lead aVL or it may be biphasic. Right atrial origin of the tachycardia includes the crista terminalis, tricuspid annulus, ostium of the coronary sinus, and right atrial appendage. o When the tachycardia originates from the left atrium, the P waves are upright in V1. If biphasic, the P wave is initially inverted and terminally upright. The P waves are isoelectric (flat) or negative (inverted) in lead aVL. Left atrial tachycardia includes the pulmonary veins, mitral annulus, left side of the atrial septum, and left atrial appendage. o When the tachycardia originates inferiorly from either atria, the P waves are inverted in leads II, III, and aVF. o When the tachycardia originates superiorly from either atria, the P waves are upright in leads II, III, and aVF. · The PR as well as the R-R interval may vary during the tachycardia, especially if the SVT is due to enhanced automaticity. This is in contrast to reentrant SVT, where these intervals are usually fixed and regular because the reentrant SVT follows a fixed pathway. · Nonsustained or short episodes of focal atrial tachycardia occur very frequently during monitoring. Sustained focal atrial tachycardia however is uncommon, occurring in <0.5% of symptomatic patients. · Focal atrial tachycardia can be incessant (persists for more than 12 hours per day). This can result in tachycardia-mediated cardiomyopathy, which is more common in infants and young children because they are unable to communicate their symptoms when having the tachycardia. Although tachycardia-mediated cardiomyopathy from focal atrial tachycardia is not common, it is one of the few causes of dilated cardiomyopathies that can be reversed if the arrhythmia is identified and successfully treated. · If the tachycardia originates from the right atrium close to the sinus node, or in the right superior pulmonary vein, the tachycardia may be mistaken for sinus tachycardia. Atrial tachycardia with 2:1 AV block can be mistaken for atrial flutter with 2:1 AV block. In atrial tachycardia with block, the baseline between 2 P waves is isoelectric, unlike atrial flutter where the baseline between 2 flutter waves is wavy and undulating. The treatment for these different arrhythmias is not the same. 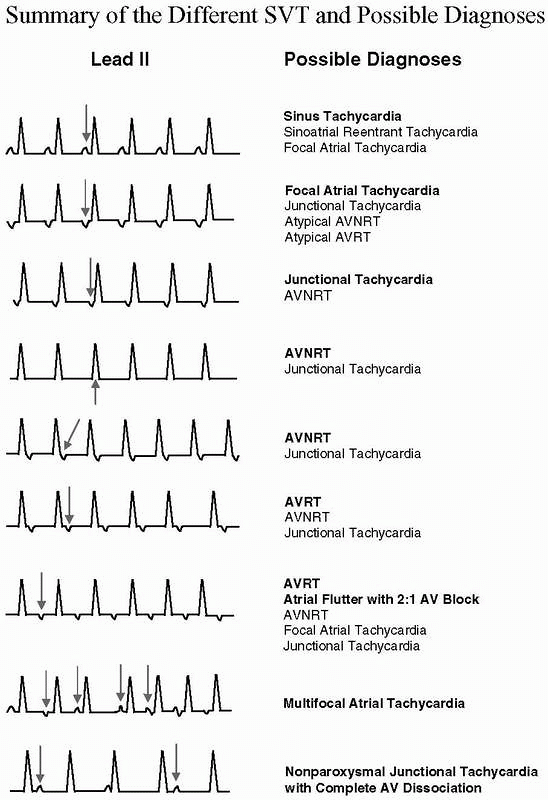 · Focal atrial tachycardia can also be mistaken for atypical AVRT, atypical AVNRT, and junctional tachycardia. All these arrhythmias have P waves preceding the QRS complex with a shorter PR than R-P interval. In general, atypical AVRT and atypical AVNRT may be terminated with vagal maneuvers or with AV nodal blockers. When AVNRT or AVRT terminates, the last part of the tachycardia is a retrograde P wave. In focal atrial tachycardia, the SVT terminates with a QRS complex. This type of tachycardia should be recognized because this may not respond to adenosine. · The size of the P wave may also be useful in identifying a retrograde P wave originating from the AV node. Because the AV node is in the lower mid-atria, the retrograde P waves may be narrow in AVNRT and in AV junctional tachycardia since both atria are activated simultaneously, whereas the P waves from focal atrial tachycardia or AVRT are broader. · Focal atrial tachycardia may be due to acute myocarditis, chronic cardiomyopathy, or a local pathology in the atria such as an atrial tumor. It can also occur spontaneously in muscle sleeves of veins directly draining into the atria such as the pulmonary veins, vena cava, and coronary sinus. These cells may possess automatic properties similar to that of the sinus node and become the dominant pacemakers of the heart when their firing rate is enhanced. Focal atrial tachycardia can be due to pharmacologic agents such as dobutamine and other catecholamines, theophylline, caffeine, and nicotine. When focal atrial tachycardia is due to digitalis toxicity, the tachycardia is usually associated with 2:1 AV block. 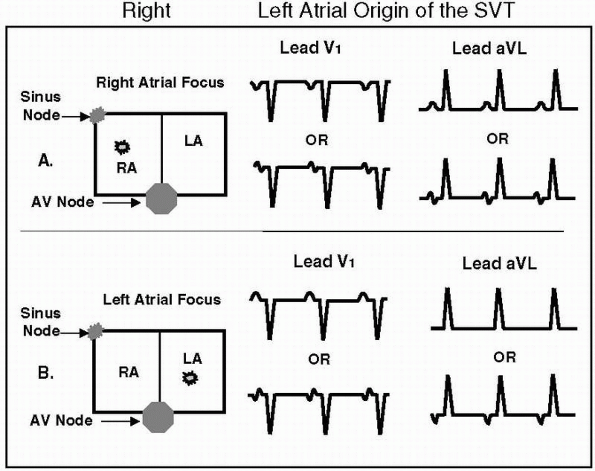 · The atrial impulse is conducted to the ventricles through the normal AV conduction system. AV block can occur because the tachycardia is not dependent on the AV node. Vagal maneuvers and AV nodal blockers (adenosine, beta blocker, calcium channel blockers, and digitalis) can slow down the ventricular rate by causing AV block, but may not terminate the arrhythmia. However, if the mechanism of the SVT is due to micro-reentry or triggered activity, the tachycardia may be responsive to adenosine or verapamil. · If the tachycardia is due to digitalis toxicity, digitalis should be discontinued. Digitalis toxicity is enhanced by hypokalemia, hypomagnesemia, and hypercalcemia. These electrolyte abnormalities should be corrected. Potassium supplements are usually given to minimize the effects of digitalis toxicity. The use of digoxin binding agents should be considered if the arrhythmia is persistent and is poorly tolerated. · Tachycardia is also precipitated by metabolic and blood gas disorders or use of pharmacologic agents such as theophylline, albuterol, or catecholamines. These metabolic and respiratory abnormalities should be corrected and the offending agents should be discontinued. · Because focal atrial tachycardia is a regular narrow complex tachycardia, the tachycardia is difficult to distinguish from atypical AVNRT and atypical AVRT. Thus, the acute treatment for the tachycardia is similar to any regular narrow complex SVT. These include vagal maneuvers, AV nodal blockers such as adenosine, beta blocker, calcium channel blockers, and digitalis (if digitalis is not the cause of the tachycardia). A significant number of focal atrial tachycardia (atrial tachycardia due to micro-reentry or triggered activity) may respond to adenosine or verapamil. Thus, adenosine remains the drug of choice for any regular narrow complex tachycardia and should be tried before other agents are considered. If the tachycardia is not responsive to adenosine or AV block occurs without converting the SVT to normal sinus rhythm, longer acting AV nodal agents such as diltiazem, verapamil, or beta blockers can be given to slow down the ventricular rate by causing AV block. · Focal atrial tachycardia from enhanced automaticity generally will not respond to adenosine. Class IA (procainamide), Class IC (flecainide and propafenone), or Class III (sotalol, amiodarone) antiarrhythmic agents should be considered if adenosine and other AV nodal blocking agents are not effective. · Electrical cardioversion is not effective when the mechanism of the tachycardia is due to enhanced automaticity but may be effective if the tachycardia is due to intra-atrial reentry or triggered activity. Unless patient is in circulatory shock, electrical cardioversion is contraindicated when the tachycardia is known to be due to digitalis toxicity (atrial tachycardia with 2:1 AV block with history of digitalis intake) or the tachycardia is due to metabolic or electrolyte abnormalities. · When the tachycardia is intractable to medical therapy, electrical ablation (or if not feasible, surgical excision) of the arrhythmogenic focus should be considered. · In infants and young children, in whom the tachycardia is more difficult to detect, the mortality is high because a tachycardia-mediated cardiomyopathy may occur. This type of cardiomyopathy is reversible if the tachycardia is recognized as the cause of the cardiomyopathy. · Focal atrial tachycardia is usually associated with structural cardiac diseases. The prognosis will depend on the etiology of the cardiac abnormality. The overall prognosis of focal atrial tachycardia from digitalis excess and metabolic, respiratory, or electrolyte abnormalities will depend on the underlying condition. In the absence of structural cardiac disease, the overall prognosis is generally good. Figure 17.7: Focal Atrial Tachycardia. The electrocardiogram is from a patient with acute exacerbation of asthma. The P waves are inverted in aVL and are upright in leads II, III, and aVF suggesting a superior left atrial origin of the impulse. 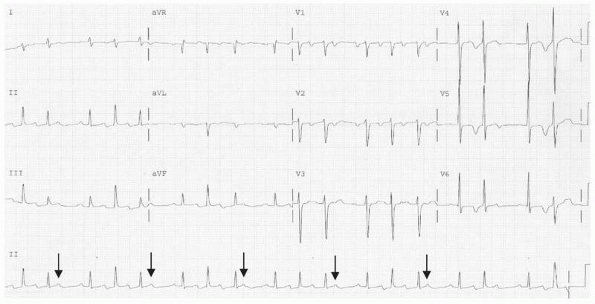 Electrical alternans is seen in leads II and in all precordial leads (arrows). Although electrical alternans is frequently associated with AVRT, it is also seen in other types of supraventricular tachycardia as shown here. AVRT, atrioventricular reentrant tachycardia. Figure 17.8: Focal Atrial Tachycardia. The P waves are inverted in leads II, III, and aVF and upright in V1. The PR interval is >0.12 seconds and the R-P interval is longer than the PR interval. This type of SVT is usually due to focal atrial tachycardia originating from the inferior wall of the left atrium. The above SVT, however, is difficult to differentiate from atypical AVNRT, atypical AVRT, or junctional tachycardia. Because the P waves are broad, the SVT is more likely the result of focal atrial tachycardia or AVRT rather than AVNRT or junctional tachycardia. SVT, supraventricular tachycardia; AVNRT, atrioventricular nodal reentrant tachycardia; AVRT, atrioventricular reentrant tachycardia. 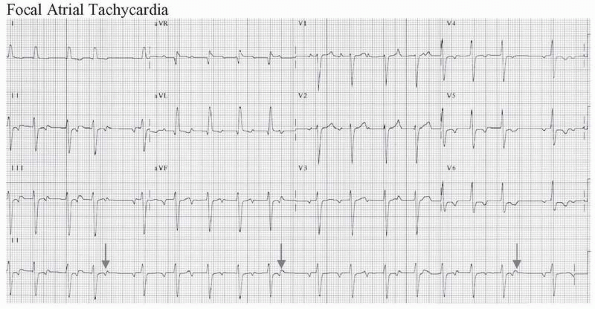 Figure 17.9: Focal Atrial Tachycardia with Second-Degree Atrioventricular (AV) Block. The P waves precede the QRS complexes and are inverted in leads II, III, and aVF, negative in aVL, and upright in V1. There is gradual prolongation of the PR interval until a ventricular complex is dropped (arrows). Because second-degree AV block is present, AVRT is not possible and AVNRT is highly unlikely. AVNRT, atrioventricular nodal reentrant tachycardia; AVRT, atrioventricular reentrant tachycardia. Figure 17.10: Focal Atrial Tachycardia with Second-Degree Atrioventricular (AV) Block. A 12-lead electrocardiogram showing focal atrial tachycardia with second-degree AV Wenckebach. The P waves precede the QRS complexes with a rate of 150 beats per minute. The mechanism of the focal atrial tachycardia was thought to be IART because the patient had previous atrial septal defect repair, which is a possible focus of reentry. The patient was successfully cardioverted electrically to normal sinus rhythm. Focal atrial tachycardia from enhanced automaticity generally does not respond to electrical cardioversion. The presence of AV block excludes AVRT and upright P waves in II, III, and aVF makes AVNRT unlikely. AVNRT, atrioventricular nodal reentrant tachycardia; AVRT, atrioventricular reentrant tachycardia; IART, intraatrial reentrant tachycardia. Arrows point to the nonconducted P waves. · Multifocal atrial tachycardia (MAT): MAT is characterized by the presence of atrial complexes originating from different foci in the atria. The P waves are irregular with varying sizes and shapes and varying PR and R-R intervals (Figs. 17.11,17.12,17.13,17.14). Because the R-R intervals are irregular, the arrhythmia can be mistaken for atrial fibrillation. · The diagnosis of MAT is based on the presence of three or more consecutive P waves of different morphologies with an isoelectric baseline between P waves with a rate >100 bpm. · Typical examples of MAT are shown in Figures 17.12,17.13,17.14. Figure 17.11: Multifocal Atrial Tachycardia (MAT). Diagrammatic representation of MAT showing at least three consecutive P waves of different sizes and shapes with a rate >100 beats per minute. · At least three consecutive P waves with different morphologies with a rate >100 bpm should be present. · The PR as well as the R-R interval is variable with isoelectric baseline between P waves. · MAT is most probably due to enhanced automaticity. Multiple independent automatic foci are present in the atria, resulting in varying configurations of the P wave. Figure 17.12: Multifocal Atrial Tachycardia (MAT). The electrocardiogram shows MAT. For MAT to be present, three consecutive P waves of varying morphologies should be present with a rate >100 beats per minute. The rate is irregular, the PR intervals are variable, and the baseline between two P waves is isoelectric. · MAT is also called chaotic atrial tachycardia. When the rate is <100 bpm, the arrhythmia is often called chaotic atrial rhythm or multifocal atrial rhythm. Because of the irregular heart rate, the tachycardia is often mistaken for atrial fibrillation. · MAT is commonly seen in elderly patients with acute exacerbations of chronic obstructive pulmonary disease (COPD) as well as those with electrolyte or metabolic abnormalities and pulmonary infection. Most of these patients with acute exacerbations of COPD are on theophylline or beta agonists. These medications are implicated as the cause of the MAT. Figure 17.13: Multifocal Atrial Tachycardia (MAT). In MAT, the QRS complexes are preceded by P waves of varying sizes and shapes. At least three consecutive P waves with varying morphologies are present with a rate over 100 beats per minute (arrows). · Treatment of the tachycardia is directed toward the underlying cause, which is usually COPD. If the patient is on theophylline or beta agonist, the drug should be discontinued. Any electrolyte, blood gas, or metabolic abnormality should be corrected. Any associated cardiac disease or pulmonary infection should be treated. · MAT should be differentiated from atrial fibrillation. Patients with atrial fibrillation need to be anticoagulated, whereas patients with MAT do not need anticoagulation. · The rate of the tachycardia is usually not rapid and usually does not exceed 130 bpm. However, because MAT occurs more frequently in elderly individuals with COPD, the rate may not be tolerable especially when there is heart failure, ischemic heart disease, or respiratory insufficiency. Pharmacologic therapy may be necessary to control the rate of the tachycardia. o Nondihydropyridine calcium channel blockers may be used to control the ventricular rate and diminish the number of ectopic atrial impulses. Diltiazem (20 mg IV) or verapamil (5 to 10 mg IV) may be given intravenously. Diltiazem may be continued as an IV infusion drip at 5 to 15 mg per hour after the rate has been controlled with the initial bolus. Verapamil should not be given if there is left ventricular dysfunction (ejection fraction ≤40%) or there is heart failure. o Although beta blockers are also effective, these drugs are usually contraindicated because MAT is frequently seen in the setting of bronchospastic pulmonary disease. In patients without reactive airway disease, beta blockers are effective agents. o Although antiarrhythmic agents are usually not indicated for MAT, amiodarone may be tried for rate control and for suppression of ectopic atrial impulses if the arrhythmia has not improved with the above agents. Magnesium given intravenously has also been used with varying success when other agents have failed even in the absence of hypomagnesemia. o Digitalis is not effective and has a narrow margin of safety in patients with chronic pulmonary disease and should not be given. o MAT frequently deteriorates to atrial fibrillation. The rate in atrial fibrillation may be easier to control than the rate in MAT; however, anticoagulation may be necessary. · Electrical cardioversion has no place in the therapy of MAT. MAT is an example of SVT from enhanced automaticity and electrical cardioversion will not be effective. Figure 17.14: Multifocal Atrial Tachycardia. Note the presence of P waves of varying morphologies preceding each QRS complex (arrows) in the long lead rhythm strip at the bottom of the tracing. The baseline between P waves remains isoelectric. · The arrhythmia is usually well tolerated and prognosis depends on the underlying medical condition. o Nonparoxysmal junctional tachycardia: The SVT has a slower rate of 70 to 120 bpm. Despite the very slow rate of <100 bpm, the arrhythmia is considered a tachycardia since the intrinsic rate of the AV junction is exceeded, which is usually 40 to 60 bpm (Fig. 17.15). AV junctional rhythm with a rate ≤100 bpm is more appropriately called accelerated junctional rhythm rather than junctional “tachycardia.” The tachycardia is nonparoxysmal with a slow onset and termination. This type of tachycardia may be due to enhanced automaticity or triggered activity. o Paroxysmal or focal junctional tachycardia: This type of tachycardia is rare. The tachycardia is also called junctional ectopic tachycardia or automatic junctional tachycardia. The American College of Cardiology/American Heart Association Task Force on Practice Guidelines/European Society of Cardiology guidelines on SVT refer to this tachycardia as focal junctional tachycardia. The tachycardia varies from 110 to 250 bpm and is often paroxysmal with sudden onset and abrupt termination. The mechanism of the tachycardia is due to enhanced automaticity or triggered activity. 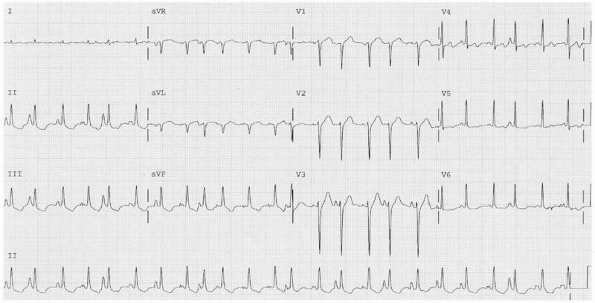 · ECG findings: The ECG of AV junctional tachycardia overlaps those of other SVT. Because the tachycardia is not dependent on the atria or ventricles, the relationship between the P wave and the QRS complex is variable. The retrograde P waves are narrow and may occur before or after the QRS complex. It may also be synchronous with the QRS complex. When this occurs, the P waves are not visible. The diagrams in Fig. 17.16 summarize the ECG findings of junctional tachycardia. Figure 17.15: Nonparoxysmal Junctional Tachycardia. No P waves are noted in the entire 12-lead electrocardiogram. Although the ventricular rate is <100 beats per minute, the arrhythmia is accepted as junctional tachycardia since the rate exceeds the intrinsic rate of the atrioventricular junction, which is 60 beats per minute. Figure 17.16: Junctional Tachycardia. (A) Atrial activation occurs earlier than ventricular activation (P wave is in front of the QRS complex). (B) Atrial activation is synchronous with ventricular activation (no P waves are present). (C) Ventricular activation occurs earlier than atrial activation (P waves occur after the QRS complex). (D) Complete atrioventricular dissociation during normal sinus rhythm (#1) and during atrial fibrillation (#2). Figure 17.17: Nonparoxysmal Junctional Tachycardia. Lead II rhythm strip showing accelerated junctional rhythm at 87 beats per minute. Retrograde P waves are inscribed just before the QRS complexes (arrows), which can be mistaken for Q waves (pseudo-Q waves). Note that the P waves are narrow measuring less than 0.05 seconds. Figure 17.18: Nonparoxysmal Junctional Tachycardia. Lead II rhythm strip again showing accelerated junctional rhythm at 73 beats per minute. Note that the retrograde P waves are inscribed after the QRS complexes and are narrow (arrows). Because the P waves occur during ventricular systole, this can result in cannon A waves in the jugular neck veins. Figure 17.19: Nonparoxysmal Junctional Tachycardia. The initial half of the tracing shows nonparoxysmal junctional tachycardia of 106 beats per minute. There is isorhythmic atrioventricular dissociation (arrows) until the sinus P waves capture the QRS complexes at a slightly higher rate of 110 beats per minute. Figure 17.20: Accelerated Junctional Rhythm with Complete Atrioventricular Dissociation. The atrial and ventricular rates are almost similar at 80 beats per minute. The sinus P waves however are completely dissociated from the QRS complexes. Arrows point to the P waves. Figure 17.21: Paroxysmal Junctional Tachycardia. (A)Twelve-lead electrocardiogram (ECG) of a 6-year-old boy with paroxysmal tachycardia with a rate of 206 beats per minute. There are no P waves during tachycardia and is consistent with paroxysmal junctional tachycardia. (B) A 12-lead ECG on conversion to normal sinus rhythm. · simultaneously. When it follows the QRS complex, the R-P interval is usually ≤0.20 seconds. · The rate of the tachycardia can be enhanced by sympathetic or parasympathetic manipulation. Atropine, dobutamine and other adrenergic agents can increase the rate of the tachycardia. Examples of nonparoxysmal junctional tachycardia are shown in Figures 17.17,17.18,17.19,17.20. · Paroxysmal or focal junctional tachycardia is rare. The SVT is more commonly seen in children than in adults. Shown is a 12-lead ECG of a 6-year-old boy with paroxysmal tachycardia from focal junctional tachycardia. The tachycardia has no P waves making it difficult to differentiate from AV nodal reentrant tachycardia (Fig. 17.21). · The ECG findings of nonparoxysmal and paroxysmal or focal junctional tachycardia are similar except for the difference in rate, onset, and termination of the tachycardia. o The QRS complexes are narrow unless there is preexistent bundle branch block or the impulse is conducted with aberration. o The QRS complexes are regular. In focal junctional tachycardia, the ventricular rate is 110 to 250 bpm. In nonparoxysmal junctional tachycardia, the ventricular rate is slower and varies from 70 to 130 bpm. o The P waves may occur synchronously with the QRS complex and may not be visible. o When P waves are present, they are retrograde and are inverted in leads II, III, and aVF. The retrograde P waves may occur before or after the QRS complexes. When the retrograde P waves occur before the QRS complexes, the PR interval is short and is usually <0.12 seconds. When the retrograde P waves follow the QRS complexes, the R-P interval is usually ≤0.20 seconds. o Complete AV dissociation may occur since the tachycardia does not need the atria (or the ventricles) for its participation. The sinus node captures the atria; however, the ventricles are separately controlled by the junctional tachycardia resulting in complete AV dissociation. o A junctional tachycardia can also occur in the presence of atrial fibrillation resulting in regularization of the R-R interval since the ventricles are completely dissociated from the atria. · The AV junction includes the whole AV node down to the bifurcation of the bundle of His. The AV node consists of three parts with distinct electrophysiologic properties. The superior portion of the AV node is the atrionodal or AN region, which lies directly adjacent to the atria. The middle portion of the AV node is the main body or nodal (N) region and the distal part that is directly contiguous to the bundle of His is the nodo-His or NH region. The AV junction, excluding the middle portion of the AV node, contains cells with automatic properties that may compete with the sinus node as the pacemaker of the heart. Although cells in the AV junction have automatic properties, the intrinsic rate of these cells is slower than that of the sinus node. These cells therefore are normally depolarized by the spread of the faster sinus impulse and serve as latent or backup pacemakers. When the firing rate of the cells in the AV junction is enhanced and becomes faster than the rate of the sinus node, junctional rhythm may become the dominant rhythm. · The junctional rhythm may control both atria and ventricles simultaneously. The impulse is conducted anterogradely to the ventricles through the normal conduction system resulting in QRS complexes that are narrow, similar to the QRS complexes of normal sinus rhythm. The P waves are retrograde and are inverted in leads II, III, and aVF because the atrial impulse travels from below upward in the atria. 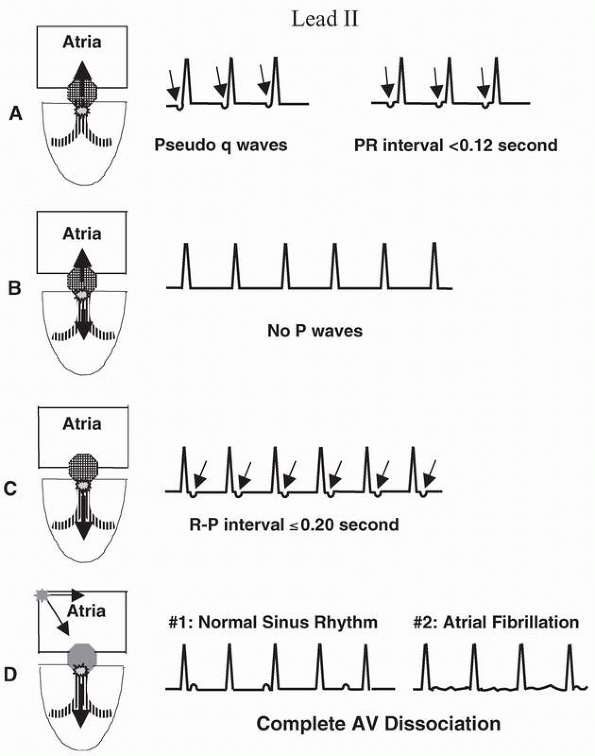 The retrograde P waves are narrower (thinner) than the normal sinus P waves because the atria are activated simultaneously when the rhythm starts from the AV junction. o The retrograde P waves may occur in front of the QRS complexes if retrograde conduction of the junctional impulse to the atria is faster than anterograde conduction to the ventricles. o The retrograde P waves may follow the QRS complex if anterograde conduction of the impulse to the ventricles is faster than retrograde conduction to the atria. o The P waves may not be visible if conduction of the impulse to the atria and ventricles are synchronous resulting in simultaneous activation of both chambers. When this occurs, the smaller P wave will be embedded within the larger QRS complexes and will not be visible. o The junctional rhythm may also control the ventricles but not the atria, if retrograde conduction of the impulse is blocked at the AV node. When this occurs, the sinus node may retain control of the atria resulting in complete or incomplete AV dissociation. If there is atrial fibrillation, the ventricles are controlled independently by a junctional impulse causing the R-R intervals to become regular. This is usually the case when there is digitalis toxicity. · Nonparoxysmal junctional tachycardia may be due to enhanced automaticity involving cells within the AV junction or it may be due to triggered activity. Triggered activity as a mechanism for tachycardia usually occurs when conditions are abnormal, such as when there is digitalis toxicity, increased intracellular calcium, or marked adrenergic activity. Digitalis prevents the exchange of sodium and potassium during repolarization by inhibiting the enzyme Na+/K+ ATPase. The build up of Na+ inside the cell causes the Na+/Ca++exchange mechanism to be activated resulting in accumulation of Ca++ inside the cell. The increased Ca++ inside the cell is the mechanism by which digitalis exerts its positive inotropic effect. When there is digitalis toxicity, the less negative membrane potential due to calcium overload may “trigger” afterdepolarizations to occur during phase 4 of the action potential. These afterdepolarizations may reach threshold potential resulting in a series of action potentials that may become sustained. 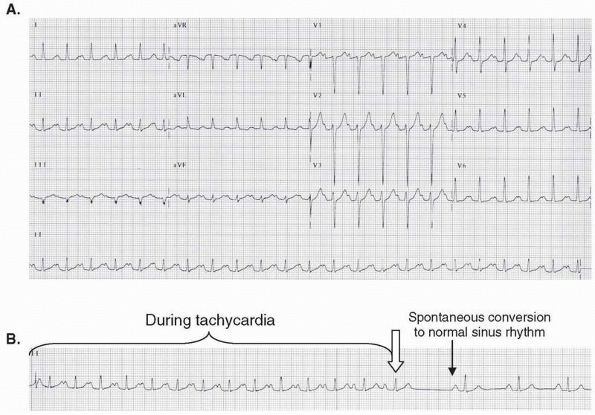 Nonparoxysmal junctional tachycardia and atrial tachycardia with 2:1 block are arrhythmias that are usually due to digitalis toxicity (see SVT due to Triggered Activity in this chapter). 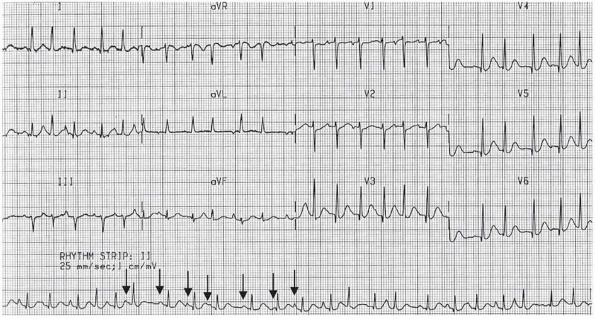 · Most junctional tachycardia seen in the adult is nonparoxysmal. The tachycardia is relatively common and the diagnosis can be made fairly easily. It has a rate of 70 to 120 bpm. Although the rate of the tachycardia could be <100 bpm, the arrhythmia is traditionally accepted as tachycardia because it exceeds the intrinsic rate of the AV junction, which is 40 to 60 bpm. Junctional impulses with rates <100 bpm are preferably called accelerated junctional rhythm rather than junctional tachycardia. · The tachycardia is nonparoxysmal because of its gradual onset and termination. The tachycardia is usually self-limiting, often lasting for a few hours to a few days even without therapy. Although the arrhythmia is benign and may not be associated with any hemodynamic abnormalities, nonparoxysmal junctional tachycardia may be a marker of a serious underlying cardiac condition because the tachycardia usually occurs in the setting of acute inferior myocardial infarction, myocarditis, congestive heart failure, hypokalemia, digitalis toxicity, and use of pharmacologic agents such as dobutamine and other sympathomimetic agents. The arrhythmia can also occur after cardiac surgery. It may be a manifestation of sick sinus syndrome. It may also occur in normal individuals. · The rate of nonparoxysmal junctional tachycardia is relatively slow; thus, the arrhythmia is usually tolerable and may not cause any symptom. However, because the QRS complexes are not preceded by P waves, the tachycardia may result in hemodynamic deterioration because of loss of atrial contribution to left ventricular filling especially in patients with left ventricular dysfunction. This can result in low cardiac output and hypotension. When retrograde P waves follow the QRS complex, atrial contraction occurs during ventricular systole, when the AV valves are closed, resulting in cannon A waves in the neck and pulmonary veins. This can cause hypotension and low cardiac output mimicking the symptoms of pacemaker syndrome (see Chapter 26, The ECG of Cardiac Pacemakers). · Nonparoxysmal junctional tachycardia is seldom incessant (the tachycardia seldom persists >12 hours a day). When this occurs, a tachycardia-mediated cardiomyopathy can occur. This complication is more frequently seen in focal junctional tachycardia, which has a faster rate and is more common in infants and children, most of whom are unable to complain of symptoms related to the arrhythmia. · Focal junctional tachycardia is rare in adults. It is also rare, but is more common in children. Paroxysmal junctional tachycardia has a rate of 110 to 250 bpm. The tachycardia is paroxysmal because of its sudden onset and abrupt termination. The tachycardia is also called junctional ectopic tachycardia or automatic junctional tachycardia. The tachycardia may be associated with congenital heart disease such as ventricular or atrial septal defects, although they are also seen in structurally normal hearts. They can also occur during the immediate postoperative period. When the tachycardia is incessant, meaning the tachycardia occurs more than 12 hours per day, it may cause a tachycardia-mediated cardiomyopathy especially in children. · Nonparoxysmal junctional tachycardia has a relatively slow rate, is very well tolerated, and often self-limiting and generally does not need any drug therapy. It may be related to an underlying abnormality, which should be recognized and corrected. This includes electrolyte and metabolic abnormalities such as hypokalemia, blood gas disturbances, chronic obstructive pulmonary disease, myocardial ischemia, or inflammatory disorders involving the myocardium. It can also be triggered by digitalis toxicity and use of dobutamine and other sympathomimetic agents. · The presence of nonparoxysmal junctional tachycardia or accelerated junctional rhythm with a rate of <100 bpm may be a sign of underlying sinus node disease. When sinus node dysfunction is suspected, the junctional rhythm should not be suppressed. 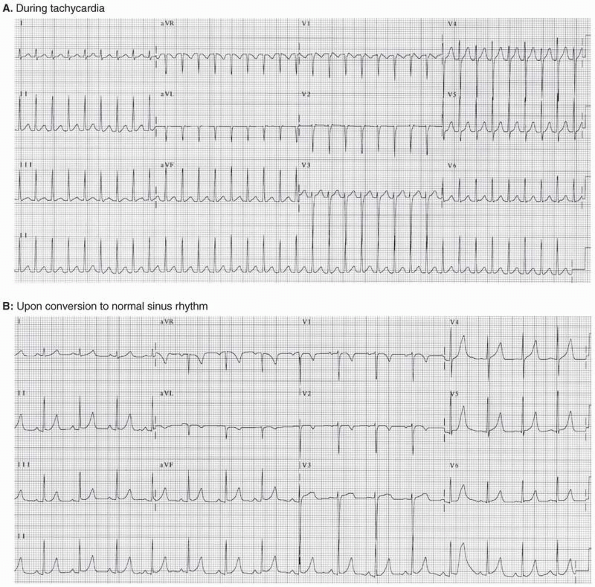 · Nonparoxysmal junctional tachycardia is frequently due to digitalis toxicity. Digitalis should be discontinued if the drug is the cause of the tachycardia. If digitalis is continued inappropriately, it may result in more serious, even fatal, arrhythmias. The arrhythmia can be monitored without additional therapy if the rate of the tachycardia is <100 bpm and the patient is hemodynamically stable. Any electrolyte or metabolic abnormality should be corrected. If the tachycardia is rapid or there is hypokalemia, potassium supplements should be given. Potassium should also be given if the serum level is <4 mEq/L, especially in postoperative patients. The rate of the tachycardia can be slowed with phenytoin 5 to 10 mg/ kg IV given as a 250-mg bolus diluted with saline and injected IV slowly over 10 minutes, followed by 100 mg IV every 5 minutes as needed to a maximum dose of 1 g. Phenytoin is effective only if the tachycardia is digitalis induced. Side effects of hypotension, profound bradycardia, or respiratory depression can occur especially if the phenytoin is rapidly administered. Beta blockers given IV have also been used to control the ventricular rate (see Appendix, Commonly Used Injectable Pharmacologic Agents, specifically sections on intravenous dosing with metoprolol, atenolol, esmolol, or propranolol). Treatment with digoxin-immune Fab fragments should be considered if the arrhythmia is life-threatening or the patient is hemodynamically unstable and digitalis toxicity is the cause of the tachycardia. It should also be given if the digoxin level exceeds 10 ng/mL. · The pharmacologic treatment of nonparoxysmal junctional tachycardia not due to digitalis toxicity is similar to that of focal junctional tachycardia. · In patients with accelerated junctional rhythm (nonparoxysmal junctional tachycardia) with retrograde P waves occurring during ventricular systole associated with symptoms of hypoperfusion and low cardiac output mimicking the pacemaker syndrome, temporary atrial or AV sequential pacing is usually effective. · If the rate of the tachycardia is unusually rapid, such as the case with focal junctional tachycardia, the tachycardia should be treated like any regular narrow complex tachycardia. Although focal junctional tachycardia is rare, the ECG findings mimic those of AVNRT, AVRT, and focal atrial tachycardia, which are more common and are more responsive to adenosine. Thus, adenosine should be tried initially and if not effective, beta blockers or nondihydropyridine calcium channel blockers should be tried (see Treatment of AVNRT in this chapter). · If AV nodal blockers are not effective, type IC (flecainide or propafenone) and type III (amiodarone or sotalol) agents may be tried to suppress the ectopic focus. The choice of antiarrhythmic agent should be based on the presence or absence of left ventricular dysfunction. When left ventricular dysfunction is present, amiodarone is the preferred agent. · In patients who do not respond to medications or in patients in whom the tachycardia continues to become recurrent or incessant, catheter ablation may be considered. Ablative procedures may be associated with some risk of AV block because the foci involves the AV node and bundle of His. · Nonparoxysmal junctional tachycardia is usually associated with structural cardiac disease or digitalis excess but the arrhythmia itself is self limiting. Focal junctional tachycardia may also occur in structurally normal hearts and is more common in pediatric patients and young adults. If the tachycardia becomes incessant, it may result in tachycardia-mediated cardiomyopathy. · The overall prognosis depends on the underlying cardiac disease associated with the tachycardia. · Triggered activity: Another possible mechanism of SVT is triggered activity. Triggered activity is due to the presence of afterdepolarizations. These are additional depolarizations that are triggered by the previous action potential. Afterdepolarizations may be single or repetitive and may not always reach threshold potential. However, when these afterdepolarizations reach threshold potential, repetitive firing may result in sustained arrhythmia. This is unlike enhanced automaticity, which is not dependent on the previous impulse but is caused by automatic firing of a cell because of the presence of phase 4 diastolic depolarization. Afterdepolarizations occur when conditions are abnormal, such as when there is digitalis toxicity or when there is excess calcium or catecholamines. · Triggered automaticity may be due to early or late afterdepolarizations. o Early afterdepolarizations: These are afterdepolarizations that occur during phase 2 or phase 3 of the action potential (Fig. 17.22A). o Late afterdepolarizations: These are afterdepolarizations that occur during phase 4 of the action potential (Fig. 17.22B). · The role of triggered activity as a cause of SVT is uncertain except in atrial tachycardia with 2:1 AV block and in nonparoxysmal junctional tachycardia. Both arrhythmias are frequently associated with digitalis toxicity (Figs 17.23,17.24,17.25). Figure 17.22: Triggered Activity. (A) Triggered activity from early afterdepolarizations (phase 2 or 3 of the action potential). (B) Triggered automaticity from late afterdepolarizations (phase 4 of the action potential). The dotted line represents threshold potential and 0, 1, 2, 3, and 4 represent the different phases of the action potential. The arrows point to afterdepolarizations. · Atrial tachycardia with 2:1 AV block: Atrial tachycardia with 2:1 AV block is an arrhythmia resulting from triggered activity. This tachycardia is almost always from digitalis toxicity. Digitalis excites atrial and ventricular myocytes, which may result in atrial and ventricular tachycardia. Digitalis also blocks the AV node; thus, the combination of atrial tachycardia with AV block usually in a 2:1 ratio, is most commonly an arrhythmia related to digitalis toxicity (Fig. 17.24). The tachycardia arises from a single focus in the atria close to the sinus node, causing the P wave to be upright in leads II, III, and aVF, resembling sinus tachycardia (Figs. 17.25). · Atrial tachycardia with varying degrees of AV block may occur in patients who are not on digitalis. In these patients, the mechanism for the tachycardia may be due to enhanced automaticity rather than triggered activity. · Fig. 27.26 summarizes the different ECG patterns of narrow complex SVT and Fig. 27.27 is an algorithm how to diagnose narrow complex tachycardias. Figure 17.23: Supraventricular Tachycardia (SVT) from Triggered Activity. (A) Atrial tachycardia with 2:1 atrioventricular block is an example of SVT due to triggered activity. The ectopic focus (arrow) usually originates from the right atrium close to the sinus node (arrow). 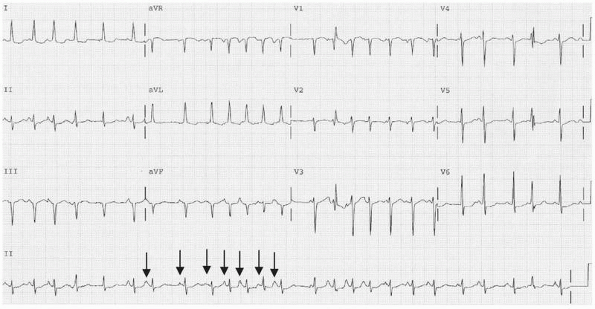 (B) Nonparoxysmal junctional tachycardia arising from the AV junction (arrow). Figure 17.24: Atrial Tachycardia with 2:1 Atrioventricular (AV) Block. The P waves (arrows) are upright in lead II with a rate of 230 beats per minute. Atrial tachycardia with 2:1 AV block is usually from digitalis toxicity. The configuration of the ST segment is typical of digitalis effect. · When a narrow complex tachycardia with a QRS duration of <0.12 seconds is present, the ECG should first be inspected for gross irregularity of the R-R intervals. o Multifocal atrial tachycardia: Distinct P waves of different configurations are present preceding each QRS complex. o Atrial fibrillation: The baseline shows fibrillatory waves. No definite P waves or flutter waves are present. o Atrial flutter: Flutter waves are present with a saw tooth or undulating baseline. · Complete AV dissociation with regular R-R intervals (Fig. 17.34): When there is complete AV dissociation with regular R-R intervals, AVRT is not possible and AVNRT is highly unlikely. This is almost always due to junctional tachycardia with complete AV dissociation. · Retrograde P Waves with second-degree AV Wenckebach (Fig. 17.35): This is almost always due to focal atrial tachycardia. This excludes AVRT and makes AVNRT highly unlikely. Figure 17.25: Atrial Tachycardia with 2:1 Atrioventricular Block. The patient is not on digitalis. The atrial rate is approximately 180 beats per minute and the baseline between the P waves is isoelectric. Figure 17.26: Different Electrocardiogram Patterns of Narrow Complex Supraventricular Tachycardia in Lead II. The best possible diagnosis is highlighted in bold letters and is listed from top to bottom. The algorithm for diagnosing narrow complex tachycardia is shown in the next page. AVNRT, atrioventricular nodal reentrant tachycardia; AVRT, atrioventricular reentrant tachycardia. · When the R-R interval is irregular, atrial fibrillation, multifocal atrial tachycardia, and atrial flutter with variable AV block are the main considerations. Focal atrial tachycardia with variable AV block is also possible although rare. · When the R-R interval is regular, the diagnosis of the tachycardia depends on the location and polarity of the P waves in lead II. Figure 17.27: Algorithm for Diagnosing Narrow Complex Tachycardia. AVNRT, atrioventricular nodal reentrant tachycardia; AVRT, atrioventricular reentrant tachycardia. Figure 17.28: Narrow Complex Tachycardia with Irregular R-R Intervals. When the R-R interval in a narrow complex tachycardia is grossly irregular, the possibilities include multifocal atrial tachycardia (MAT), atrial fibrillation, and atrial flutter with variable atrioventricular block. Figure 17.29: Supraventricular Tachycardia with Regular R-R intervals and No P Waves. This is commonly due to atrioventricular nodal reentrant tachycardia. Junctional tachycardia is another possibility, although this is not as common. Figure 17.30: Regular R-R Intervals with Upright P Waves before QRS complexes in Lead II. This is almost always the result of sinus tachycardia. Focal atrial tachycardia and sino-atrial reentrant tachycardia are other possibilities. Figure 17.31: Retrograde P Waves in Front of the QRS Complex. This is most commonly the result of focal atrial tachycardia. Other possibilities include atypical atrioventricular nodal reentrant tachycardia, atypical atrioventricular reentrant tachycardia, and junctional tachycardia, both paroxysmal and nonparoxysmal. Figure 17.32: Retrograde P Waves with R-P Interval Equal to PR Interval. Atrial flutter with 2:1 AV block is a distinct possibility with the second flutter wave embedded within the QRS complexes. This can also be due to AVRT, focal atrial tachycardia, atypical AVNRT and junctional tachycardia both paroxysmal and nonparoxysmal. 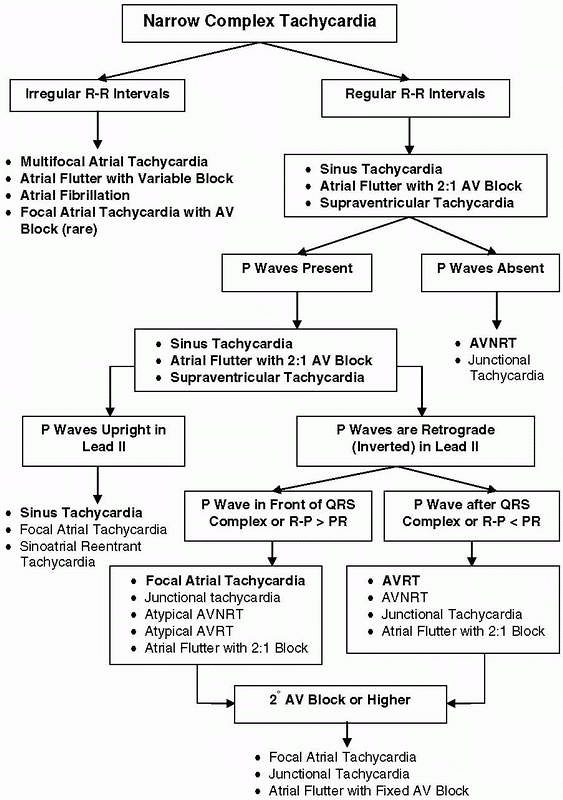 AV, atrioventricular; AVNRT, atrioventricular nodal reentrant tachycardia; AVRT, atrioventricular reentrant tachycardia. Figure 17.33: Retrograde P Waves with R-P Interval <PR Interval. This is typically from atrioventricular reentrant tachycardia. Other possibilities include atrioventricular nodal reentrant tachycardia and junctional tachycardia both paroxysmal and nonparoxysmal. Arrow points to the retrograde P wave. Figure 17.34: Junctional Tachycardia with Complete AV Dissociation. The P waves are upright in lead II and are completely dissociated from the QRS complexes. The upright P waves represent normal sinus rhythm. Figure 17.35: Retrograde P waves with Second-Degree Atrioventricular Wenckebach. This is almost always from focal atrial tachycardia. Focal junctional tachycardia is also possible, but is unlikely. · Identification of the P wave (or its absence) is crucial to the diagnosis of narrow complex tachycardia. Several maneuvers are often helpful in identifying the P waves if they are not obvious in the surface ECG. o Although the P wave should be inspected in all 12 standard leads of the ECG, leads II and V1 are the most useful. Lead II is very useful, especially in determining the polarity of the P wave and therefore the origin of the tachycardia. o The ECG may be magnified to 2X the standard size and the speed of the recording may be doubled so that the P waves may be better identified. This maneuver is usually not very useful unless the voltage of the ECG is small especially in the limb leads (lead II). § The left arm electrode can be used as the exploring electrode and positioned at different areas in the precordium. The rest of the extremity electrodes retain their usual position. The ECG is recorded in lead I. § If this maneuver is not helpful, a Lewis lead can be recorded by placing the left arm electrode over the fourth right intercostal space beside the sternum (V1 position) and the right arm electrode at the second right intercostal space beside the sternum. The ECG is recorded in lead I. § An esophageal pill electrode can be swallowed and positioned behind the left atrium. The electrode is connected to a standard precordial lead such as V1. § Intracardiac recordings may be obtained by inserting an electrode transvenously into the atria and connected to a standard precordial lead such as V1. § If a central line is already in place, intracardiac ECG can be obtained by filling the length of the catheter with saline. The tip of the central line should be near or at the right atrium and if multiple catheter lumens are present, the port closest to the right atrium should be used. A needle is inserted and left at the injecting port of the catheter. The needle is connected to V1 or any precordial lead in the ECG (usually with an alligator clamp) and recorded in V1. 2005 American Heart Association Guidelines for Cardiopulmonary Resuscitation and Emergency Cardiovascular Care. Part 7.3: management of symptomatic bradycardia and tachycardia. Circulation. 2005;112:IV-67-IV-77. Bar FW, Brugada P, Dassen WRM, et al. Differential diagnosis of tachycardia with narrow QRS complex (shorter than 0.12 second). Am J Cardiol. 1984;54:555-560. Blomstrom-Lunndqvist C, Scheinman MM, Aliot EM, et al. ACC/AHA/ESC guidelines for the management of patients with supraventricular arrhythmias—executive summary: a report of the American College of Cardiology/American Heart Association Task Force on Practice Guidelines, and the European Society of Cardiology Committee for Practice Guidelines (Writing Committee to Develop Guidelines for the Management of Patients With Supraventricular Arrhythmias). J Am Coll Cardiol. 2003;42:1493-1453. Chauhan VS, Krahn AD, Klein GJ, et al. Supraventricular tachycardia. Med Clin North Am. 2001;85:193-223. Chen S-A, Chiang C-E, Yang C-J, et al. Sustained atrial tachycardia in adult patients. Electrophysiological characteristics, pharmacological response, possible mechanisms, and effects of radiofrequency ablation. Circulation. 1994;90:1262-1278. Donovan KD, Power BM, Hockings BE, et al. Usefulness of atrial electrograms recorded via central venous catheters in the diagnosis of complex cardiac arrhythmias. Crit Care Med.1993;21:532-537. Engelstein ED, Lippman N, Stein KM, et al. Mechanism-specific effects of adenosine on atrial tachycardia. Circulation. 1994; 89:2645-2654. Esberger D, Jones S, Morris F. ABC of clinical electrocardiography: junctional tachycardias. BMJ. 2002;324: 662-665. Farre J, Wellens HJJ. The Value of the electrocardiogram in diagnosing site of origin and mechanism of supraventricular tachycardia. In: Wellens HJJ, Kulbertus HE, eds. What's New in Electrocardiography. Boston: Martinus Nijhoff; 1981. Ganz LI, Friedman PL. Supraventricular tachycardia. N Engl J Med. 1995;332:162-173. Guidelines 2000 for Cardiopulmonary Resuscitation and Emergency Cardiovascular Care: 7D: the tachycardia algorithms. Circulation. 2000;102(Suppl I):I- 158-I-165. Haissaguerre MH, Sanders P, Hocini M, et al. Pulmonary veins in the substrate for atrial fibrillation. J Am Coll Cardiol. 2004;43:2290-2292. Kastor JA. Multifocal atrial tachycardia. N Engl J Med. 1990;322: 1713-1717. Kistler PM, Roberts-Thomson KC, Haqqani HM, et al. P-wave morphology in focal atrial tachycardia. Development of an algorithm to predict the anatomic site of origin. J Am Coll Cardiol.2006;48:1010-1017. Kistler PM, Sanders P, Hussin A. Focal atrial tachycardia arising from the mitral annulus. Electrocardiographic and electrophysiologic characterization. J Am Coll Cardiol. 2003;41: 2212-2219. Kumagai K, Ogawa M, Noguchi H, et al. Electrophysiologic properties of pulmonary veins assessed using microelectrode basket catheter. J Am Coll Cardiol. 2004;43:2281-2289. Levine JH, Michael JR, Guarnieri T. Treatment of multifocal atrial tachycardia with verapamil. N Engl J Med. 1985;312:21-25. Madias JE, Bazar R, Agarwal H. Anasarca-mediated attenuation of the amplitude of ECG complexes: a description of a heretofore unrecognized phenomenon. J Am Coll Cardiol.2001;38:756-764. Madias JE, Narayan V, Attari M. Detection of P waves via a “saline-filled central venous catheter electrocardiographic lead” in patients with low electrocardiographic voltage due to anasarca. J Am Coll Cardiol. 2003;91:910-914. Manolis AS, Mark Estes III NA. Supraventricular tachycardia mechanisms and therapy. Arch Intern Med. 1987;147: 1706-1716. Marrouche NF, SippensGroenewegen A, Yang Y, et al. Clinical and electrophysiologic characteristics of left septal atrial tachycardia. J Am Coll Cardiol. 2002;40:1133-1139. Mehta AV, Perlman PE. Ectopic automatic atrial tachycardia in children: an overview. J Arrhythmia Manage. 1990: 12-19. Olgen JE, Zipes DE. Specific arrhythmias: diagnosis and treatment. In: Libby P, Bonow RO, Mann DL, et al. eds. Braunwald's Heart Disease, A Textbook of Cardiovascular Medicine. 8th ed., Philadelphia, PA: Elsevier Saunders; 2005: 863-931. Reddy CP and Arnett JD. Automatic atrial tachycardia and nonparoxysmal atrioventricular junctional tachycardia. In: Horowitz LN, ed. Current Management of Arrhythmias. South Hamilton, Ontario: BC Decker Inc; 1991: 67-73. Salerno JC, Kertesz NJ, Friedman RA, et al. Clinical course of atrial ectopic tachycardia is age-dependent: Results and treatment in children <3 or ≥3 years of age. J Am Coll Cardiol.2004;43:438-444. Saoudi N, Cosio F, Waldo A, et al. Classification of atrial flutter and regular atrial tachycardia according to electrophysiological mechanisms and anatomical bases. Eur Heart J.2001;22:1162-1182. Tang CW, Scheinman MM, Van Hare GF. Use of P wave configuration during atrial tachycardia to predict site of origin. J Am Coll Cardiol. 1995;26:1315-1324. Wagner GS. Ventricular preexcitation. In: Marriott's Practical Electrocardiography. 10th ed. Philadelphia: Lippincott Williams and Wilkins; 2001:124-137. Wagner GS. Reentrant junctional tachyarrhythmias. In: Marriott's Practical Electrocardiography. 10th ed. Philadelphia: Lippincott Williams and Wilkins; 2001:330-344. Wellens HJJ. Atrial tachycardia. How important is the mechanism? Circulation. 1994;90:1576-1577. Wellens HJJ, Conover MB. Narrow QRS tachycardia. In: The ECG in Emergency Decision Making. 2nd ed. St. Louis: W.B. Saunders/Elsevier; 2006:92-106. Wellens HJJ, Conover MB. Digitalis-induced emergencies. In: The ECG in Emergency Decision Making. 2nd ed. St. Louis: W.B. Saunders/Elsevier; 2006:158-176. Xie B, Thakur RK, Shah CP, et al. Clinical differentiation of narrow QRS complex tachycardias. Emerg Med Clin North Am. 1998;16:295-330. Yamane T, Shah DC, Peng JT, et al. Morphological characteristics of P waves during selective pulmonary vein pacing. J Am Coll Cardiol. 2001;38:1505-1510.